GW2 Third Anniversary is here and characters who have been playing since the head start can claim their third anniversary gifts. One Experience scroll to advance any character under level 30 to Level 30. 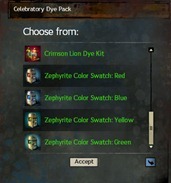 One Celebratory Dye Pack – Pick one exclusive dye from any of the existing dye kits. The dye is account bound so you cannot sell them. 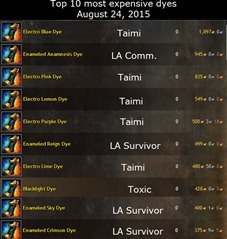 Taimi’s Dye Kit seems to contain the most expensive dyes. 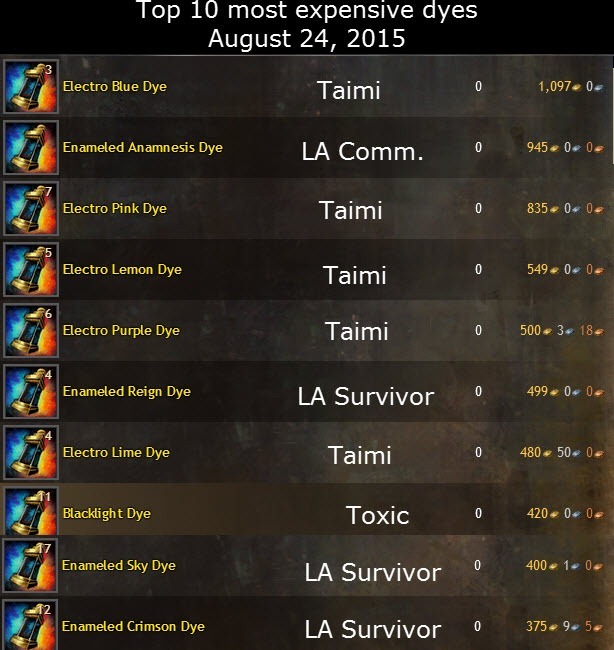 Electro Blue for example is the most expensive dye on TP and can be selected from Taimi’s dye kit. That birthday finisher is SICK! Are there only the two variations Dulfy? Hmm there is no variation on the finisher, it is all the same. Is this per account or character? I havent gotten a single thing and ive played since the start with 8k hours…. not single one of my toons sad lyfe. You will eventually get them. Those who got it now started at the headstart on August 25, 2012 at midnight pdt. If you started later then you just need to wait a bit longer. It matches with the luminescent armor. will all characters who turn 3 eventually get it? even if it is next year that they turn 3? It’s about time we got ourselves a scroll that didn’t just whoop your character to lv20. 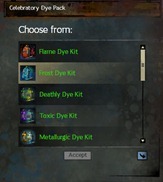 I’m also happy with the dye kit, I’ve been wanting to grab another electro dye. Dulfy you should probably add that the dyes are Account bound though, I do not see that in your post although I may have missed it. man wish I didn’t delete my character I created on launch…. 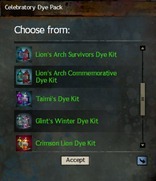 Taimi’s dye kit also contains masterwork and fine dyes so u only get a small chance to have an electro dye, right ? 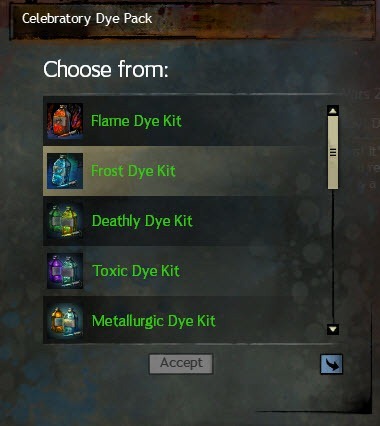 No, you get to choose the exact dye you want after you select which dye kit you would like. 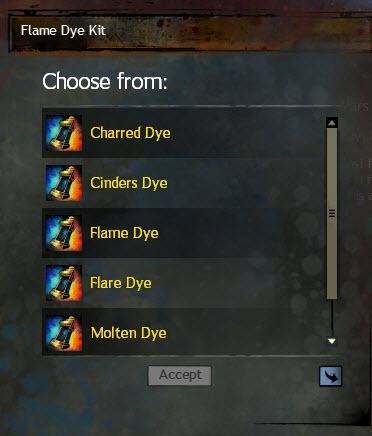 Edit: You can’t sell the dye you get so don’t choose based on how much they sell for. x_x I regret my choice already.. i just thought ”well i’ll get the expensive one just because its expensive” – realize i don’t like the Taimi colors… fml 🙁 y i do dis?! 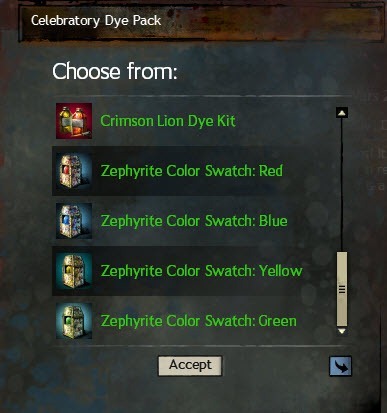 The good thing about the Celebratory Dye Pack is that you can just throw it into your bank and pick a colour when you really need it. For my next dye packs I’ll just throw it in the bank and use it when I really want a nice new colour. I have only gotten presents on my Guardian and Engineer so far. Unlocked Elector Blue and Molten. Love them both! Can’t wait to get the free, expensive dyes on my other characters! Damn, I wish to get Electro Blue too! so am i the only one who has 8 toons sens the beginning of game ? Yes. You are quite unique. Me too, 8 birthdays today! I would have but I like rerolling and starting over so only have a few older characters left. Still have my initial main though! It says the experience scroll goes to level 30. Is it really level 30 or is it level 20 like the ones from past birthdays?? 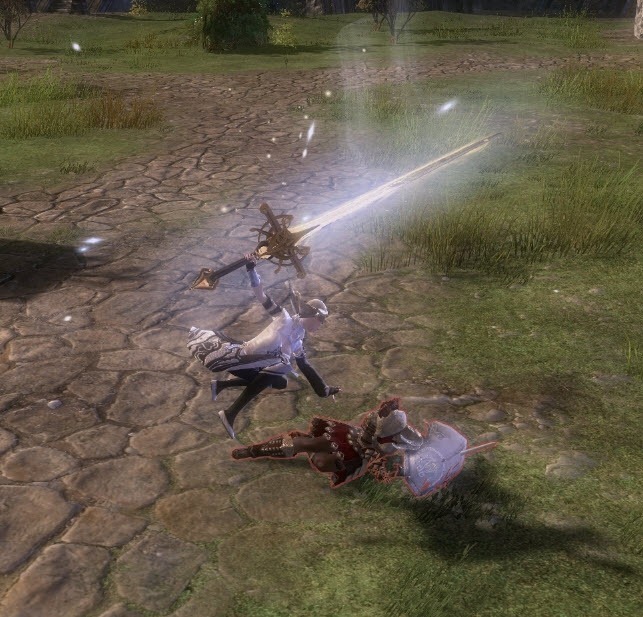 Now I wish I did not delete my Charr I started the game on……. Shadow Dyes are a “set” of dyes. 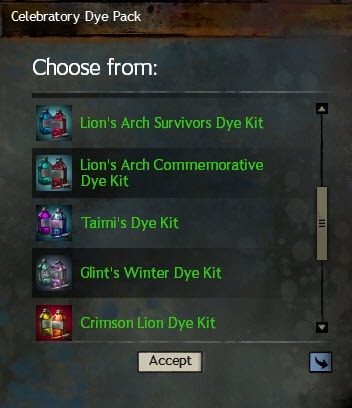 Are they not included in the choices for the Dye Gift? Were they a Gem Store set? If so, probably why they are not included. I just can’t remember. FYI, all of the packs you can get from the Celebration dye pack are past Gem store. 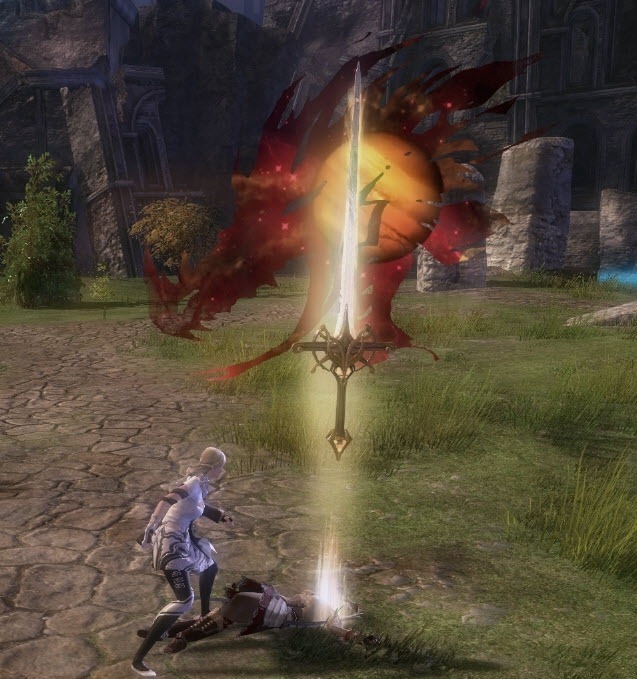 It’s just that the Shadow and Lion’s Arch Rebuild packs are probably excluded because they’re too recent, especially since the Shadow dyes are still in the store. If it’s a dark blackish color you’re after, you could always give midnight ice a try, it’s a little blueish, but it’s the darkest color you can get from there (from the Zephyrite blue pack). Dulfy, any title for the 3rd anniversary? do you know it? It’s nice, but would’ve liked skill 3 unlocked on the birthday blaster. A rapid fire would’ve been nice. did i read it correctly? new experience scroll? insta level to 30? Awesome, in five more years we’ll get scrolls for instant 80’s! 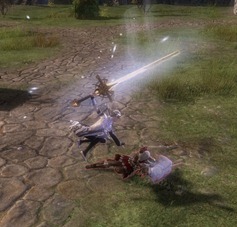 anyone recognize the sword in the finisher? nope. seems new. it’s not in the sword or greatsword wardrobe. Then wait 5 more days…. Relax! You’ll get them when your characters hit their third birthday. Electro Blue is awesome, and I picked it for one of my characters. Does anyone have any suggestions for my other picks? I’m thinking Electro Pink for one, and I have a couple of other picks as well. For anyone wanting a good black dye, the Abyss dye (NOT Shadow Abyss) is pretty decent, I even like it better as it still shows some detail. It’s available in the Lion’s Arch Survivors Dye Kit. Just that the birthday kits contain only the exclusive dyes, so you won’t find the regular ones there. 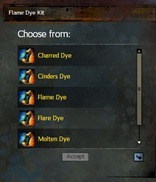 Abyss dye is not actually one of the exclusive dyes available from the Survivor’s Dye kit, unfortunately. If you got it from one, it was a random chance. So it won’t be an option you can pick from in the 3rd birthday present. I bought Enameled Anamnesis for 10 gold in February, added it to my account, and never used it. I’m really regretting not holding it to sell now. I wasn’t allowed to sell mine. And the price is not anywhere near what Dulfy states above in any case. You can’t sell them, it is account bound and I mentioned that above. The prices were like 3 months old, they have fallen since then.. So we don’t get the permanent finisher anymore?